Oral hygiene is absolutely necessary; that’s old news, but we should remind ourselves sometimes since the negligence of keeping our mouths clean could not only cause dental problems, but provoke more dysfunction to other organs of our bodies as well. Do you have suspicious minds? Are you afraid of the dentist? Tooth cleaning is not a luxurious procedure and, hence, you should stop asking: is teeth deep cleaning safe, harmful, necessary? The teeth cleaning procedure is a combination of visiting often your dentist and cleaning your teeth well at home. Food, coffee as well as other drinks like wine, smoking and the inadequate treatment and cleaning of teeth may cause stains and plaque due to the remaining of food, nicotine and other harmful substances. If we don’t treat our teeth properly by brushing them at least twice a day and flossing, we will certainly end up with bad teeth, gum diseases, cavities and terrible decays. Dentists have the proper tools with which they can remove the food remaining, the stains and the plaque. This is a relatively easy procedure and completely safe. If you bleed, it’s due to the bad condition of the gums or due to their extra sensitivity, but the bleeding stops immediately. Certainly, professional teeth cleaning will not harm the enamel. So, if you are wondering: does teeth cleaning remove stains, plaque, enamel? The answer is that there is no danger for your safety, the stains and the plaque are removed completely and the enamel is not destroyed. But, you must be extra careful when you are brushing your teeth at home. Intense brushing will eventually, remove the enamel. Some people believe that if they brush their teeth ten times within a day, their teeth and mouth will be cleaner. The best thing is to brush your teeth after every meal, but the most important thing you ought to remember is how to brush them. You must brush them gently making slow circles between the tooth and the gums. If you are too aggressive, you will end up without enamel. Therefore, you can all answer the frequent question: does teeth cleaning damage teeth, whiten teeth? Oral hygiene requires our daily proper treatment and the teeth cleaning procedure by a professional dentist. If you have any dental problems or have performed teeth whitening lately, you don’t need to worry. 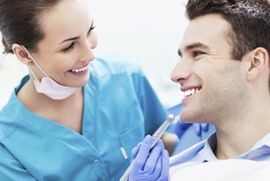 Your dentist will know exactly what to do to have a clean mouth, a fresh breath and a beautiful smile.